New week for Sac salmon! Larry Lange of Bayside, Ca. holds up a 17 lb. 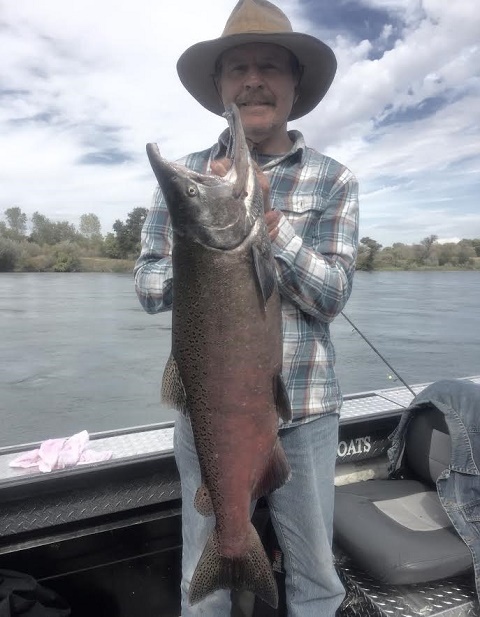 Sacramento River salmon he caught while fishing with Jeff Goodwin. Last week I wrote a salmon report that communicated a down turn in the fishing in the upper section of the Sac near Cottonwood, Ca. Well, its a new week and I'm guardedly optimistic about what I'm seeing on the river with our salmon over the last few days. New fish have been arriving and the catch rates are up a bit from last week. I guess that's good news for local salmon anglers and guides, but until the fish load up below Battle Creek and fishing is fairly good in coming weeks, I'm not going to get too excited just yet. It is still too early to tell just exactly what the end of this run will tell us, but with only a dozen or so salmon said to be waiting at Coleman National Fish Hatchery ladder, we have a long ways to go before we can say we haven't seen a complete collapse in the 2016 salmon run on the Sac. 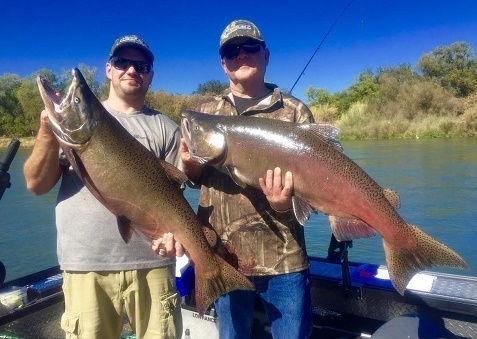 Realistically, we still have 4 solid weeks of salmon fishing ahead of us here in Shasta County, and that's a lot of time to see an improvement. 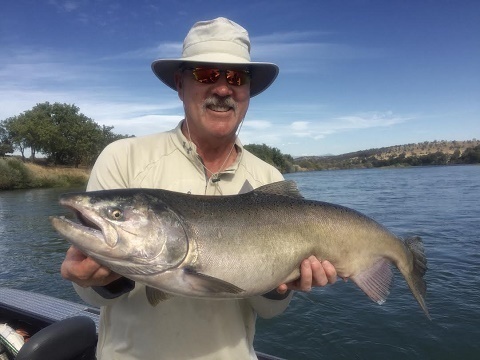 There are reports of fresh fish entering the system still and with the flows dropping on the Feather river now, the Sac still has a chance to see improved numbers of salmon swimming past the high flows and cool water the Feather had to offer these clearly wayward salmon. Salmon fishing improved for me on Friday with a score of a fish per rod in the boat. 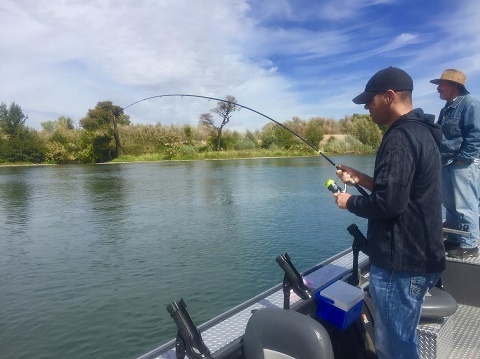 I took the weekend off to catch up on some much needed sleep, but Chris Schertz of C&A Guide Service called in a report yesterday indicating that a bunch of salmon had moved into the Red Bluff to Cottonwood area and that there was good fishing to be had! That's a positive report, and one of its kind I haven't heard of much this season. Today's rain will certainly have an effect on fishing in coming days. Either it will help the fishing or it may hurt it. Surely, it will get the fish moving, but we don't want the fish below Battle creek to disappear just yet. I'll be back on the water for the next two weeks and my strategy will likely be to hang out in the productive holding waters working on holding fish and on fish that are moving through the holes. With salmon on the move, you will find fish resting after a push up river and you will intercept pods of fish moving through as well. There's really no need to run up and down river all day looking for fish. Every hole is holding them, you just have to be patient and wait for the bite to turn on. I am fortunate to be booked solid through the remainder of the season, but if you want to get out and would like to hire a salmon fishing guide for a day, I have some great guides that I work with and can help recommend one for you. Sacramento River Salmon Run Appears!